I shared this side gig opportunity earlier this year and now I’ve got an update for you. These changes mean you’ve got another shot at the job if you missed your chance the first time. Keep reading to find out more about a job that will make you the badass of your entire social circle. Calling all herpetologists, snake whisperers and anyone interested in working outdoors in the stifling Florida heat for a few weeks. The South Florida Water Management District’s governing board recently approved a plan to hire 25 people to hunt Burmese pythons on district-owned lands in Miami-Dade County. Before you jump on this opportunity, let me break this down for you. You’ll be traipsing through the swampy Florida Everglades tracking giant, slithering snakes — hoping you find them before they find you! OK, the job is not quite that melodramatic, but that’s the gist of it. You see, Burmese pythons are a huge problem in South Florida. People adopt them as wee, cute little baby snakes, but when they get too large to keep around the house, owners dump them in the wild to live on their own. I’ll spare you the details — and especially the pictures — of what happens when Burmese pythons are allowed to wiggle to and fro unchecked all over the Everglades. Let’s just say these pythons have healthy appetites. Burmese pythons eat everything from bunnies and foxes to alligators and adult deer — and pretty much anything else that crosses their path. Oh, and they grow. A lot. In 2016, biologists in one county near the Everglades captured nearly 2,000 pounds of pythons in three months. 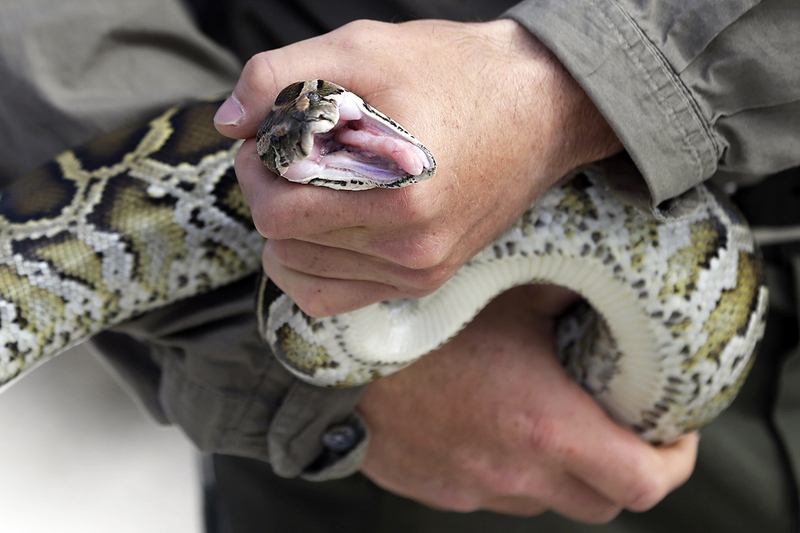 One of the snakes was 16 feet long and weighed 140 pounds, according to the Miami Herald. Amazingly, South Florida tourism is still alive and well. Personally, I think snakes are rather cool, but I get why they need to be culled with impunity. Before you go all circle of life on me about eradicating this type of snake from the area, consider this. Burmese pythons are not native to the area, and they’re eating up all the animals that are actually supposed to be there, if only to act as dinner for whatever’s higher up the food chain. As long as these snakes continue to be a slithering nuisance, they’re going to keep upsetting the natural order of things, and the entire ecosystem of the Everglades will suffer. “Floridians should have no sympathies for this notorious strangler,” the district’s governing board chairman, Dan O’Keefe, told WFLA. Look, I like snakes as much as the next person (seriously! ), but even I understand these unwanted guests have got to go. Possess a valid driver’s license and email address. Own a mobile device that can run GPS software. Have no felony record or convictions for wildlife-related offenses within the last five years. If hired, you’ll work up to eight hours a day from April 1 to June 1 tracking pythons on SFWMD-owned land across Miami-Dade County. Think Python Hunting is Easy? Think Again. In case you assume this job will be a piece of snake-shaped cake, keep in mind that pythons are notoriously hard to find. Back in 2013, a whole cavalry of 1,600 hunters only found 68 during an entire month of searching. Starting pay is minimum wage, which is $8.10 per hour in Florida. That’s what you’ll get paid just for searching for the little buggers. An additional $50 for pythons that measure up to 4 feet. An extra $25 for each foot in length beyond 4 feet. Another $100 for each python that’s guarding a nest of eggs. Ready to apply? Keep an eye on this page to be first in line when jobs become available. SFWMD will get in touch with more detailsssssssssssssss. Lisa McGreevy is a staff writer at The Penny Hoarder and a former snake owner. People stopped coming over to her house for a while, but she’s sure there was no connection.